Semir Zeki, Professor of Neuroesthetics, on Michelangelo’s Pietà. GB Why did you choose this work? SZ I fell under the spell of Michelangelo’s Pietà at St. Peter’s Basilica at first sight. You might say it was love at first sight. It was perhaps my first experience of the real, unsettling, emotional experience of beauty; it was an intense experience perhaps comparable to that of hearing Beethoven’s Eroica Symphony for the first time, but surpassing it. It is, as someone (I think Barbara Tuchman) once described it, a requiem in marble. I was in my late teens, and on my first trip alone as a tourist. My first destination was the Vatican, not because I am in any way religious, but because it is a ‘must-see’. It was on rainy day, in June. I walked past Bernini’s piazza, with its two joyous fountains and its two outstretched arms designed as if to welcome the weary pilgrim to the joy and solace that is to be found inside the Basilica. But once inside, I found no solace. This was before it was encased in bullet-proof glass, after it had been attacked and so one could get a better view of it than one can today. The glorious sculpture was disturbing and arousing and so overwhelmingly beautiful that the springs of feeling welled up and the flood of tears could neither be contained nor controlled. What I saw was a miracle, something that is too huge and too overwhelming to understand and much too difficult to describe; it defies the boundary between the sublime and the beautiful, because it is both. It is unbearably beautiful. So, when you ask me why I chose this piece, it is because its impact was immediate and powerful and emotionally riveting, and that impact has persisted, though perhaps not with the same intensity as on first view. It is elevating and disturbing; it leaves me with the experience of beauty – a strong aesthetic emotion – to this day. But it is more than that – it also gives one knowledge that is difficult to express in words – knowledge about compassion, pathos, resignation, triumph even in suffering. Of course, subsequent viewings may not have had the immediate, powerful emotional impact that I experienced on first view; but the emotional impact is still there and the value of the work has been heightened in other ways, since I know a lot more about it now than I did then. GB Michelangelo’s commission for this piece included the official wording that he must create “the most beautiful work of marble in Rome, one that no living artist could better.” What has happened to that desire to create the most beautiful work in the world? SZ I know very little about today’s art world and what individual artists aim for now. But judging by what is prized and valued today, I am not at all certain that beauty ranks high among them or that artists pursue it or are encouraged to do so in art schools. Rather, the emphasis seems to be on producing things that are different, or that shock or capture the market. Marcel Duchamp played a cruel and enduring joke on the art world when he sent a urinal as an exhibit to an art exhibition and followed this up with his Ready-mades – “art without an artist” as he called them. He was of course poking fun at the art world on the one hand and emphasizing a truth on the other. But I also believe that it caused huge and enduring damage – a damage that can be viewed regularly in museums of modern and contemporary art, with their meaningless collections of bricks and pebbles and filing cabinets and empty rooms. The artists behind these works are licensed by the curators, and indeed encouraged by them, to channel their energies into creations that supposedly make us think about ourselves and our relation to the external world, and ending up with works that are neither beautiful nor provocative, except perhaps in a very negative sense. Perhaps one can gain knowledge by looking at an empty filing cabinet or at some chair – but is it worth spending the time getting knowledge of that sort? What kind of useful knowledge, or indeed knowledge, will I gain from contemplating an empty and new filing cabinet or a bricked-up window? Knowledge of a much higher order can be obtained by contemplating the divine creation of Michelangelo. Perhaps one of the most absurd consequences of Duchamp’s joke is exemplified by a recent sale, or rather attempted sale, of an empty canvas. The work, if such one may call it, is by Bob Law and entitled Nothing To be Afraid Of V 22.8.69. According to the auctioneer’s catalogue, which gave an estimate of £60,000 for the “painting”, Law “had applied the seductive idea of nothing to a canvas, and asks the viewer to reflect”. Bob Law was described in the same catalogue as “the most underestimated and overlooked minimal artist in Britain …[who] didn’t get the recognition that he deserved”. An incredulous David Hockney commented politely: “It seems to me that if you make pictures there should be something on the canvas”. In fact, the piece did not find any buyers, perhaps illustrating forcefully the limits of how much you can make people think through the vacuous. Please do not misunderstand me; I actually like empty walls and spaces because they can also trigger the imagination. But do I really have to go to an art gallery to see an empty space? GB At this time the beauty of art was judged by the standards of ancient Greece and Rome. And yet we still find this work beautiful. Is it a universal beauty? Is it objectively beautiful? SZ Most would today refrain from talking about objective beauty and emphasize instead that beauty is largely subjective. But the very fact that the standards set by Greece and Rome are still compelling tells me in fact that there are objective characteristics that render a work beautiful. This can be ascertained with both positive and negative evidence. For a face to be experienced as beautiful, its constituents must have certain relationships to one another; any departure from these relationships immediately disqualifies a work from being experienced as beautiful. This is something that Francis Bacon, in particular, understood well. He wanted, he said, to give viewers a “visual shock” and succeeded in doing so by subverting the brain’s template for what a normal face or body looks like. The consequence is that few describe Bacon’s work as beautiful even though many agree that it has artistic merit of the highest order. This does not mean to say that to qualify as beautiful a face or a body must have all the constituents in the right place; there are no doubt other determinants of beauty but what they are is not universally agreed on, at least in scientific literature. That there are some objective characteristics to beauty may, however, perhaps be discerned from ordinary experience. I think that a very beautiful person belonging to one race will also be thought of as beautiful by many if not most from another race. Even here there may be departures. But these departures are probably too insignificant to be called exceptions. This brings me to an important event in my explorations of the neural mechanisms which enable us to experience beauty. Many years after my own tumultuous experience of the beauty of Michelangelo’s Pietà, I received a letter from a young Japanese admirer. He wrote: “ I know nothing of Christian culture and nothing of Western culture either. 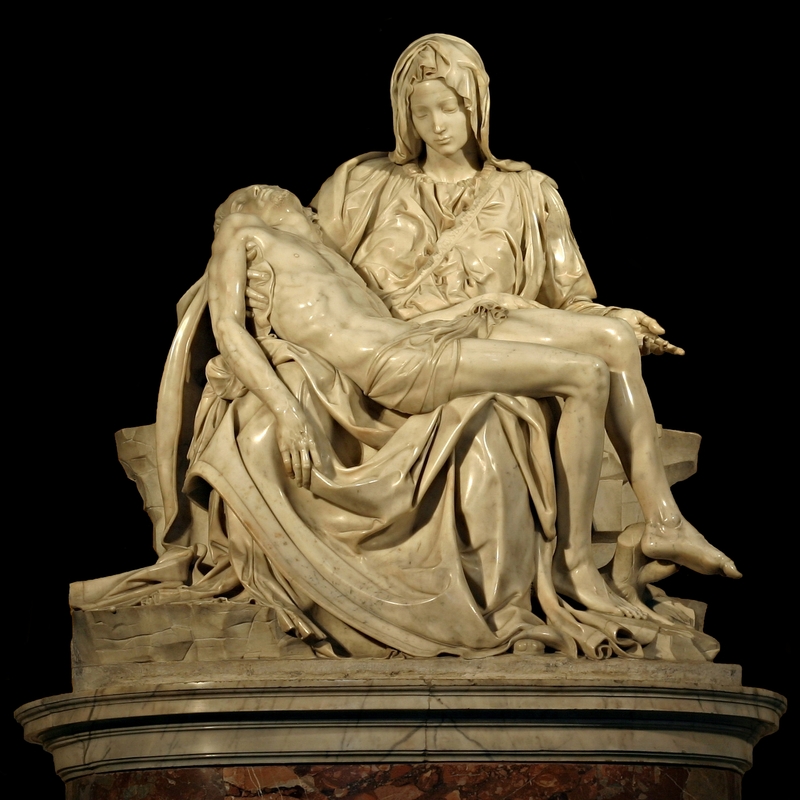 But when I saw Michelangelo’s Pieta on a recent visit to Rome, I was overwhelmed with tears. Can you explain how this happens and what makes it possible?” I can’t yet, but the similarity and what it signifies is important: Two men, divided by age and race and culture but united in a unique aesthetic and emotional experience derived from the same source? Does this not speak of some neural mechanism for aesthetic experience that is common to all humanity? It is worth pointing out that in creating a work of beauty (as opposed to a work of art), there is no trend to follow; a great creator today does not confine himself to the pursuit of what other artists have found. Proust, in Contre Sainte Beuve, explains this in the following way: “that, for an artist, the work of his predecessors do not constitute, as in science, an acquired reality which profits those who follow. A writer of genius, today, has to start anew. He is not more advanced than Homer. GB From the point of view of neuroscience, is there any similarity between a transcendent experience in looking at art and a religious experience? SZ This is a very interesting, if awkward, question. I cannot answer it scientifically but can address it in light of what I have read. In a very real sense, experiencing the beauty of the Pieta amounts to a spiritual experience because it cannot be traced to any single element nor can it be totally comprehended, at least at present. To that extent, it can be qualified as a religious or, better still, a spiritual experience. There is of course a strong element of the religious or spiritual in aesthetic experience. In his Vita Nuova, Dante compared Beatrice to Jesus Christ. Sufi poets were especially sensitive to beauty and believed, like Plato before them, that human beauty was a manifestation of divine beauty and therefore that, by contemplating the beauty of a youth, they were in fact contemplating God, since only He can create beauty. In more common experience, we often describe a beautiful woman as a “goddess” or a beautiful man as “a god”. It tells you something about the spiritual in the experience of beauty. GB It’s interesting to read Vasari on these Renaissance artists because there were some very unchristian elements to their motivation. Does this alter your view of the beauty in any way – that it could have been created from a competitive and materialistic impulse rather than a desire for pure beauty? SZ This does not trouble me, nor does it alter my view of beauty. Competition is a human trait and largely beneficial. Few are free from it. It is often said that Cézanne was completely indifferent to worldly success. This is not true. The language that Cézanne used to describe artists who were receiving recognition and state honours is very coarse, indeed so vulgar that I cannot reproduce it here. He, like all others, was also competitive although money may have been less a problem for him for he was relatively well off. The point is, in spite of their competitive nature and in spite of the fact that Michelangelo was not indifferent to money (apparently he left something in the region of £35 million in today’s currency when he died), neither he nor Cézanne nor any artist of great merit was or is willing to compromise their standards in the pursuit of money and glory, even if they were disappointed when not given the recognition that they felt they deserved. An artist as great as Marcel Proust, one of the great figures of world literature, spent innumerable hours on the telephone and with friends chasing a Légion d’Honneur. It is pathetic perhaps, but perfectly understandable. It does not however diminish the stature of his achievement. It is also worth noting that Michelangelo left three fifths of his sculptures unfinished, declaring in one of his Rime [Sonnets], that he will leave a work unfinished until he gets “inspiration from the divine workshop in heaven”. Likewise, Cézanne was never in a hurry to finish his work, even though he was in competition with others who were being celebrated by society. Emile Bernard once remarked that “nothing that Cézanne does is done by chance”. Hence the competitive spirit does not diminish the brilliance of a work when undertaken by great artists. GB Beauty, grandeur, craftsmanship and even meaning do not seem to contribute to a work’s value today. This seems to be a long way from the experience of aesthetic pleasure. Does that tell us something about our impulse to create art? SZ I suspect that a lot has to do with the false notion of a development in art, and the emphasis, especially since the time of Marcel Duchamp, that art and beauty are very separate pursuits. Art is not concerned with beauty alone, but has many other functions, or so we are told. Among these are: depicting society and culture, anticipating social or political change, reflecting our times and so on. For me at least, many of these works do not transmit the message that they are meant to and also do not arouse the aesthetic emotion in me (which they are not always meant to). Often the significance of the works becomes apparent only through the title or through the descriptions appended to them. But, as Malevich so well observed, if a work of art has to be supplemented by language, then it has failed as a work of art. Curators of museum and exhibitions often encourage a search for novelty by emphasizing new movements; the creative effort is then channeled in directions which are contrived, although they remain creative efforts but often not to much effect, at least on me. GB As someone concerned with beauty as well as science, do you think that making scientific discoveries can be similar to aesthetic pleasure? Is there any evidence of this in the reward systems in the brain? Mathematicians, in particular, speak movingly and are very moved by beautiful equations, some like Paul Dirac, giving beauty a higher status in mathematical formulations than simplicity. In a recent study, we found that when mathematicians view equations that they experience as beautiful, there is activity in the same part of the emotional brain, the medial orbito-frontal cortex, whose activity correlates with the experience of visual and musical beauty. It is, to them, an emotional experience. Some have even ventured to say that the experience of beauty in mathematics is a pointer to higher truths – that it tells us something about the structure of the Universe in which we have evolved. It is a very interesting thought about what beauty is. SZ Supreme beauty is to be found in Michelangelo’s great work and its characteristics define what makes something worthy of the word Beauty. It is emotionally arousing so that one “sees” it not with the intellect alone; its spell is long-lasting and does not fade; it gives knowledge about the human condition. It arouses feelings of compassion, pity and mercy (misericordia) and yet at the same time to feelings of joy.